The Dark Knight Rises is the very latest online pokie in the Batman trilogy of movies. Featuring 5 reels and 243 ways to win, along with symbols of characters directly from the Hollywood blockbuster movie, and heaps of bonus features to get you very excited. 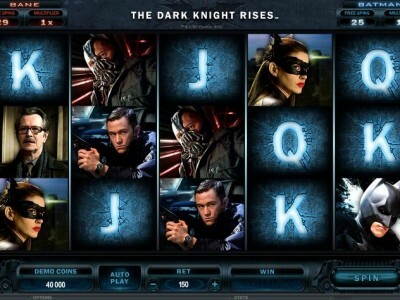 The symbols on The Dark Knight Rises online pokies include Batman, Catwoman, Bane and Police Commissioner Gordon. In order to win big you need to hit a bonus! The Dark Knight Rises features loads of bonus features and myriad ways to win! Here are the biggest ways to collect a payout. Free Spins Accumulator: In this bonus Batman and Bane fight it out to reward players with Free spins and multipliers. Symbol Scramble: This occurs randomly after a non winning spin. In this bonus all symbols rearrange to get the best possible winning combination. Split Wilds: During the free spins feature, a wild symbol can split into two creating big payouts. Therefore you can even hit a 6-of-a-kind winning way. When you hit 3 or more scatter symbols you can select the BANE feature which awards 28 free spins with a 2x multiplier, Rolling Reels™ and Super Stacked Wilds! When you hit 3 or more scatter symbols you can select the BATMAN feature which awards 33 free spins at a 4x multiplier with an Extra Wild Blast, where you get to choose a high-paying symbol to be an extra Wild, and Heat Seeking Wilds. The fun doesn’t end there because Rolling Reels, Super Stacked Wilds, Extra Wild Blasts, and Heat Seeking Wilds are also on offer when playing this Batman online pokies. This game screams payouts through endless bonuses and excellent gameplay.